Biking is a great way to improve cardiovascular health and is low-impact so it’s easy on your joints. The popularity of this sport is exploding across the world and even right here in Algonquin Provincial Park. Many people enjoy pedaling Algonquin’s Old Railway Bike Trail during spring, summer and fall, but it’s actually open all year. 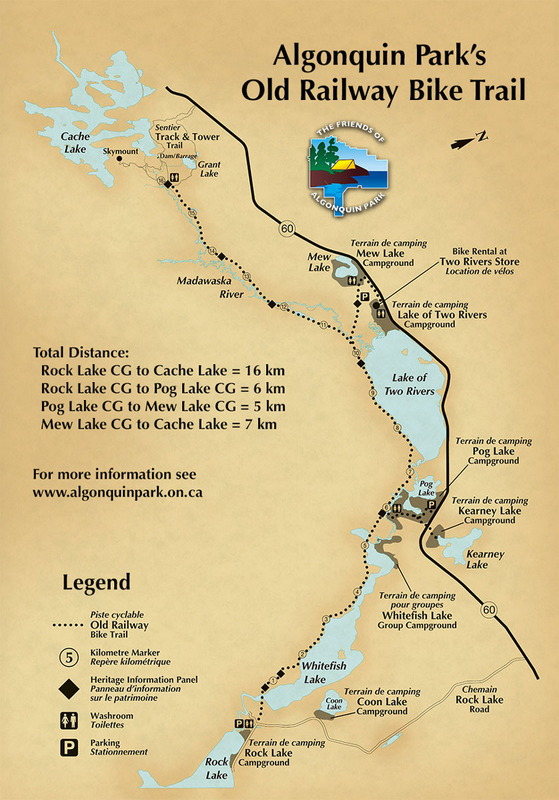 The trail is groomed a distance of approximately 12 km from Pog Lake to Cache Lake throughout the winter as a multi-recreation trail. Following the old rail bed in the park, this flat trail is a great ride even for those new to the sport. Riders can choose their desired length of ride through snow-covered conifer forests. Cycle past frozen lakes and pedal over river bridge crossings. Look for wildlife tracks left by foxes, hares, wolves and other forest friends, and listen to the songs of winter birds. Tracks on the Trail: One of Algonquin’s park naturalists spotted these tracks of an Eastern Wolf (left) and Snowshoe Hare (right) just days ago crossing the Old Railway Bike Trail. Mew Lake Campground offers the best access point, with plenty of parking, heated bathrooms and convenient trail access just steps away from the campground. You can check out a map of the trail here. Ready to pedal through the winter wonderland of Algonquin? Check out Algonquin Outfitters at their Huntsville location. They offer a range of fatbike makes and models for rental and sale. They can also bring rental bikes to the Oxtongue or Haliburton locations for pickup upon request. Prefer to try fatbiking the Old Railway Bike Trail in the spring, summer or fall? You can also rent bikes from the Two Rivers Store along Highway 60 in the park from spring until Thanksgiving weekend. The store offers convenient trail access right behind their bike shop. Don’t wait ’til spring to hit the trails again!